Free games: We have 3000 Steam keys for Mad-Max-like battle royale Fractured Lands! How’s this for a battle royale idea: PUBG meets Mad Max. That is, essentially, what’s going on in Fractured Lands. It’s a new battle royale game that is about to have its first beta test this Friday, June 8th, and another on Saturday, June 9th – and we want you to be a part of it. While you might groan at the prospect of yet another battle royale, this one does have more going for it than its adoption of the latest gaming craze – it’s made by people who previously worked on Medal of Honor, Battlefield, Call of Duty, and God of War. What also sets Fractured Lands apart from the rest is that it has a focus on vehicular combat. 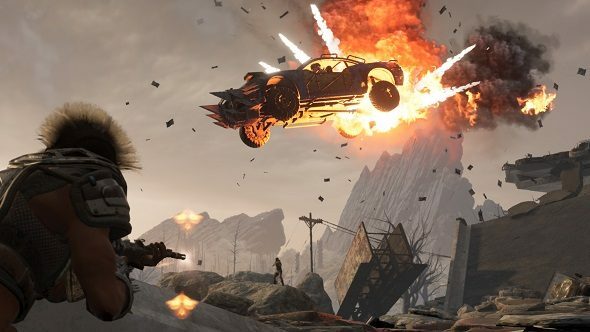 It takes place across a dusty post-apocalyptic wastelands where the multiplayer manhunt is where you biggest lifeline is your ride. And yes, you can upgrade it with scavenged armour, fuel, and weapons to make it easier to mow down your competition. As you’d expect, Fractured Lands’sintense, drive-to-survivedeathmatch is all about being the last player standing. And, of course, there’s a radioactive storm that steadily closes in on the battlefield, meaning that players are forced closer together over time. There will be more beta tests next week and at other times following that which you can see on the Fractured Lands beta test times schedule. Now then, if you want to get one of the 3000 Steam keys we have that will grant you access to the Fractured Lands closed beta then you will want to enter the competition via the widget below.